Your home has been on the market for some time and the few offers you’ve gotten are lowball offers. Now you want to know why. There are a few reasons, some might have to do with you, others with the prospective buyers. 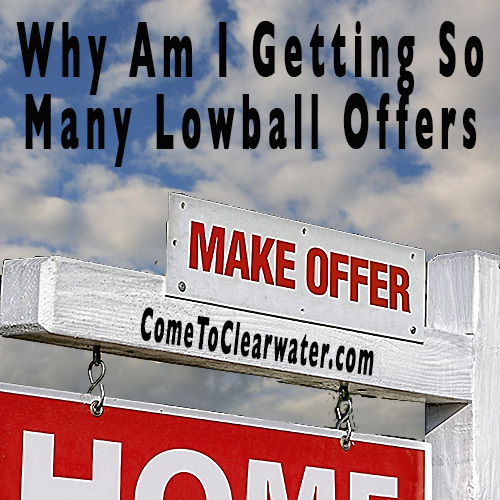 A lowball offer is when prospective buyers make offers on your property that are well below asking price. First start looking at things you can control about the sale of your home. Start with price. Is your home overpriced? This can be a touchy subject as an owner. You have an attachment to your home and most likely think that it is worth more than it may be. Next is condition of your home. It ties in with price, of course, but even if your home is priced right, condition can be a reason you are getting lowball offers. If prospects are walking through your home and thinking “I’ll need to fix that, and that, and that…” then they are mentally taking the perceived cost of fixing up the home off the asking price. If you can afford it, update, paint and fix up your home. Yes, you may need to raise the price, but the prospects may not mind the higher price if it is in better condition. If you listened to your Realtor, updated the home and priced it right, then price and condition may not be the issue. Over the last several years, home prices plummeted. Prospective buyers have become used to seeing great homes at bargain basement prices. Even though prices are now rising back to fair levels, buyers are still thinking that prices should be lower than they are. That may mean that you are getting more lowball offers than fair ones. Eventually buyers will come around, and in this situation there isn’t anything you can do to change things. Your hope here is to have your Realtor discuss pricing with the prospects or their Realtor.